At restaurant Messeyne you can dine in a tasteful, inviting environment. Chef Klaas Lauwers who perfected his skills at well-known places such as 'Hof van Cleve' and 'Marcus', serves seasonal and authentic French dishes. He succeeded in achieving and outstanding score of 14 out of 20 in the 'Gault & Millau'. Restaurant Messeyne has a well-known image in the environment and is the best place for a formal event, one-on-one dinner or for a business lunch. The stylish room at the back of the hotel can accomadate groups with a total of 42 people. This makes restaurant Messeyne an outstanding location for formal receptions, casual drinks, mourning meals, family events or private dinners. The Lounge can be used to enjoy a pre-drink or to have a private dinner with a maximum capacity of 14 people. Our professional team provides you with a menu adjusted to your wishes. 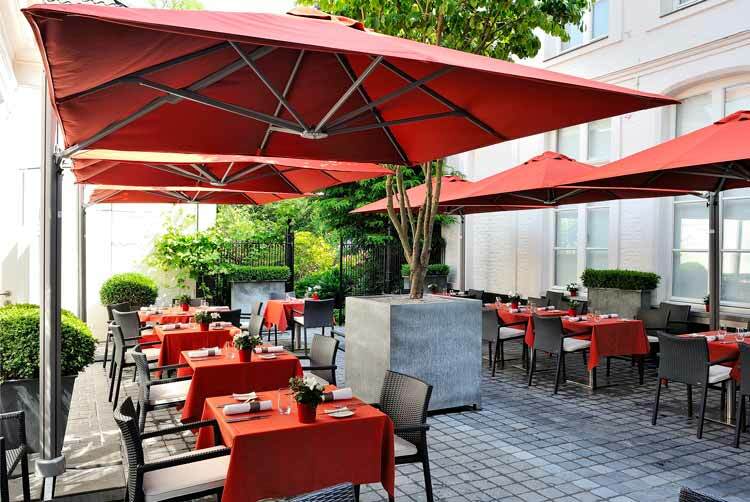 During the summer the terrace is one of the best places in the city to have a quiet and peaceful lunch or dinner. Here you can enjoy a (seasonal) refreshing drink with view on the 'Messeyne garden' or have an outdoor dinner. After sunset, we provide heaters underneath the parasols in combination with a coffee or a digestive. The private parking is located on the hotel grounds. Restaurant Messeyne is open for lunch Monday to Friday and opens its doors for dinner at 7pm. Closed on Saturday and Sunday. Copyright © 2019 Messeyne. All Rights Reserved.